When Ahrale was a child he had the same dreams that any other child has: He wanted to be a superhero with super powers. He would tie a blanket around his shoulders for a cape and jump off the bed shouting for justice. Little did he know that his dream would come true and he would grow up to be the hero of Zufim, keeping the people of that special community safe and peaceful. There is a delicate balance in Judea and Samaria between its Jewish and Palestinian populations creating a unique situation like nowhere else. Despite the media’s portrayal of what they refer to as the “West Bank,” life in Judea and Samaria is about two peoples trying to live peacefully, one beside the other. This unusual coexistence is created through the hard work and devotion of the Israel Defense Forces, the police and the community’s civilian security teams. While peaceful co-existence is the goal, Israel can never let her guard down and must be always prepared for the worst. Each community has its own security personnel protecting the residents and preventing intrusions, as well as Rapid Response Teams that are just a phone call away in case of emergency. For the past 20 years, Ahrale Lederberg has been in charge of security in Zufim, located in western Samaria. He lives there with his wife and four children, twin daughters currently serving in the IDF and two sons still in school. What started for Ahrale as a random job opportunity, quickly became a passion: “Being the head of security is a mission and I take it very seriously.” His phone is available 24 hours a day and he encourages the residents of Zufim to turn to him without hesitation. 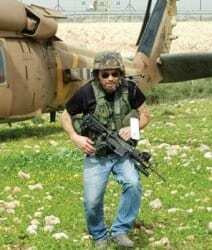 As a part of his combat military service in the “Golani” unit, Ahrale was trained as a medic and continued in that position, becoming a commander at the IDF school for medics. When he finished the army, he joined Magen David Adom, the Israeli medical emergency organization, volunteering as an ambulance driver, which he continues to do even today. Considering his medical background, his passion to protect people and his many years of experience running security in Zufim, it is clear why his phone is always ringing off the hook. Ahrale gets called for any medical or security event that transpires within the borders of the community. When I asked him to share a story with me, the events just came pouring out. He is often called in the middle of the night with a report of strangers wandering around the community’s residential area. To make sure he doesn’t bother his Rapid Response team with every call from a worried mother, Ahrale shows up first and often alone to scan the grounds and report to the rest of the team if needed. He never thinks twice and always puts the residents’ safety ahead of his own. Unfortunately, Zufim is located along a smuggling lane used by the Palestinian Arabs and Ahrale finds himself scanning the fences, preventing break-ins and cornering suspicious characters spotted in the community. His work never ends. As if he is not busy enough, Ahrale is also in charge of the emergency medical team in Zufim. He created a group of medically trained community residents who are willing to respond in case of a medical emergency. One of the members is his daughter, a paramedic in the army with the same spirit of giving as her father. In an effort to improve the local medical services, Ahrale also made sure Zufim received an ambulance that is permanently stationed in the community and can respond immediately to any medical emergency: a woman in labor, a child’s injury, heart attacks, whatever. But perhaps one of the most challenging and unusual parts of Ahrale’s job involves his daily interaction with Palestinian Arabs. In the middle of Zufim, there is an olive grove that belongs to a Palestinian family. It is very rare for an Arab to own private property in the middle of a Jewish community and it is no secret that a situation of this sort can create problems and increase tensions during unstable periods. But Ahrale is committed to protecting this Arab family and its rights, even as he protects the people of Zufim. He won’t let anything prevent the family from accessing their property and working their land. He escorts them in and out and protects the olives on nights and weekends, making sure no one trespasses. On occasion, right-wing extremists have tried to vandalize the grove but Ahrale went out in the middle of the night and made sure that they did not damage what is not theirs. He has also had to deal with radical leftists who have tried to provoke the local Arabs into activity against Zufim. Here too, Ahrale has been there protecting the Arabs, protecting the Jews. At the end of the day, he is protecting a fragile co-existence. Ahrale is truly a superhero, as he dedicates his life to protecting the people of Zufim, safeguarding their homes and their children. Thank you Ahrale!